I am scouring the Internet and magazines for office space inspirations. My office is looking drab and in major need of a make over. 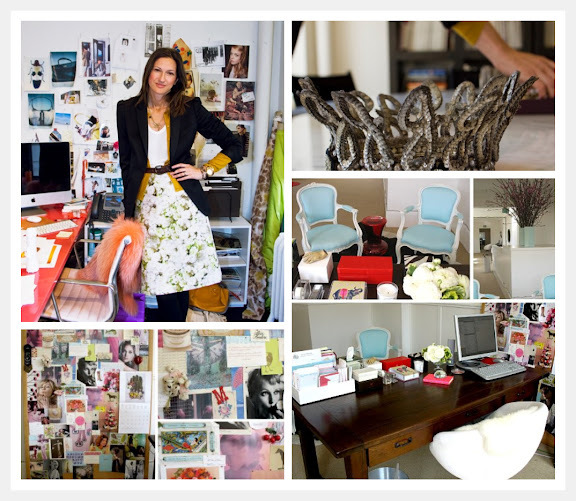 Recently, I came across the offices of Jenna Lyon's SVP of women's designs at J. Crew (aka. the lady behind Jenna's Picks) and Melissa Davis from Ruby Press PR and I instantly fell in love with their pretty details, soft colors and feminine appeal. Both women have a lot of white in their offices with a splash of blue or red. They also have their own inspiration boards displayed by their desks. I am a collage addict and have been making inspiration boards since I was young so this is something I definitely want in my office. I just can't decide if my company would approve. I love the little details they have like a nice smelling candle or Jenna's princess crown. These offices both make me excited to get out there and try something new! Time to stat shopping! Hey! what a nice office! And by the way thanks for your comment! Sorry for my late reply but I´ve been crazy!!!!!!! see you soon! Lovely office; I love how there are so many things yet it's not cluttered. I agree, this is an incredible office space! i love my little "home office" it's perfect and it always makes me feel so cozy ha i know it sounds silly but oh well! <3 can't wait to see what you'll come up with!! Love the inspiration boards! Their offices are def. pretty. Have fun decorating! I love the collage/ inspiration board. That'll be a great addition to your office space.